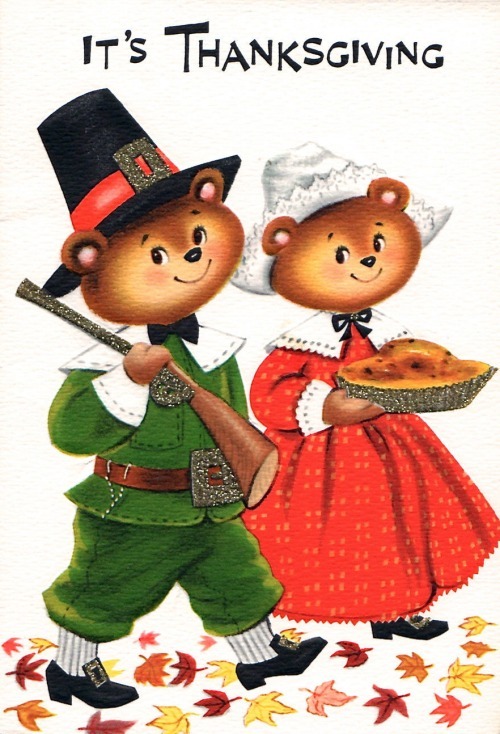 Post # 314 Happy Thanksgiving Day! 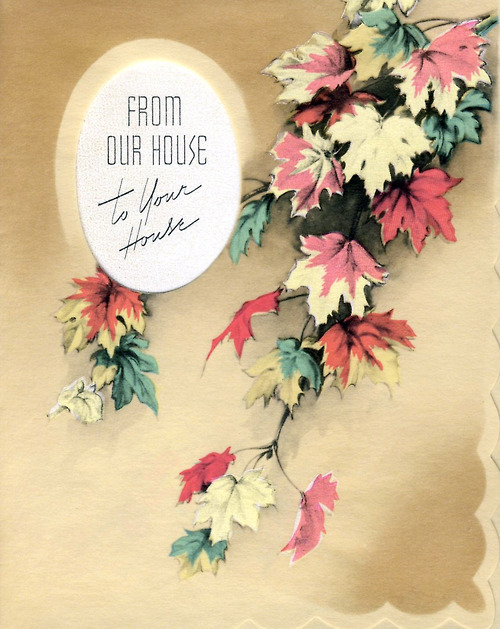 Hope you enjoy whatever holiday is in you to enjoy! Post # 313 Did You Know? November 24, 2014 at 9:19 AM | Posted in Uncategorized | Comments Off on Post # 313 Did You Know? 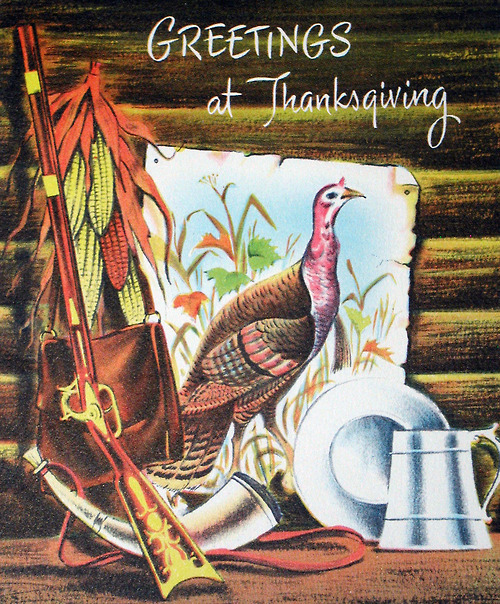 Here in the U.S. it’s the week of Thanksgiving Day. 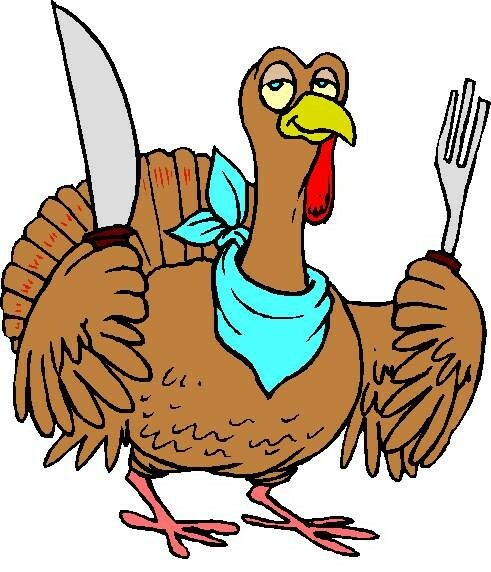 Many people are planning the Thursday feast with anticipation and trepidation. So am I. It’s a stressful time, so I’ll be taking the rest of the week off from the blog so I can concentrate on impressing my friends and family. Cuz that’s what it’s all about: showing off. Okay, I may have gotten that confused with something else, but I will be busy as the day encroaches. 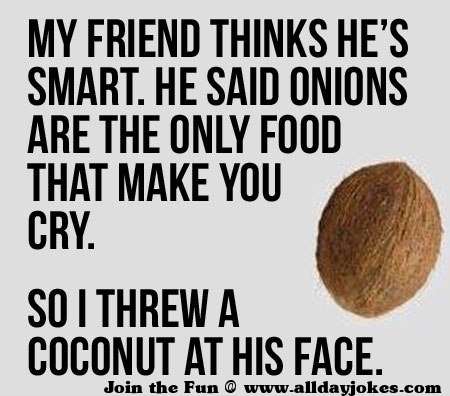 For today, I thought I’d share a bunch of food trivia with you. Hope you like! 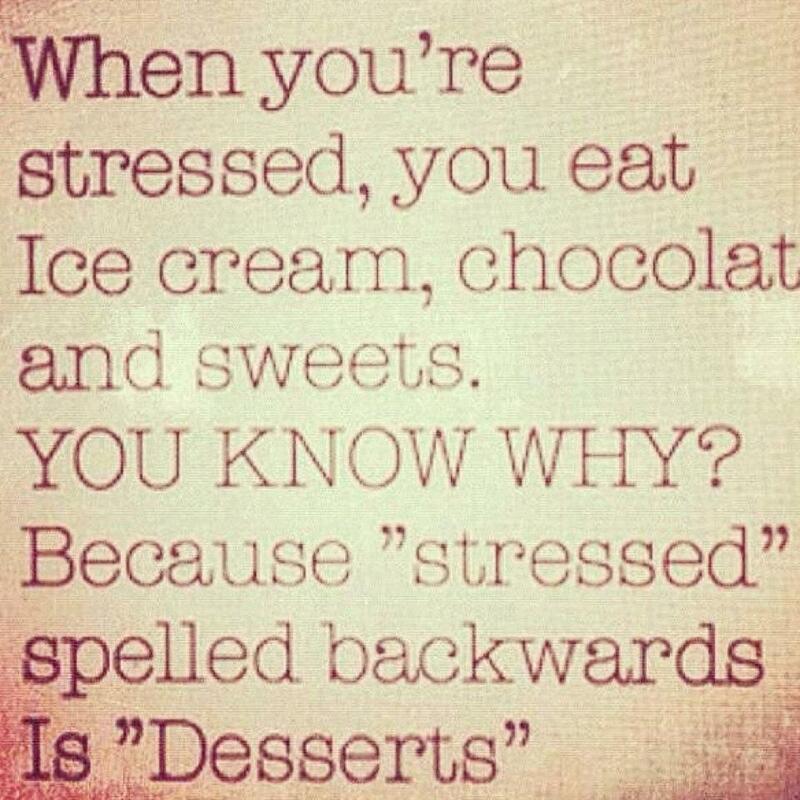 Ever wonder why humans like sweets so much. Scientist believe it’s because most poisonous things are bitter. There are some exceptions, but for the most part, bitter equals bad. People eat with their eyes first; their nose second; and their mouths last. Most of your sense of taste is in your nose. M&Ms are the number one candy in the U.S.
Hershey’s uses the most almonds in the U.S. They can have them. Doughnuts have holes so the center cooks evenly. Not so sailors can put them on ship’s wheels while steering. Cupcakes got their name because the original recipes called for one cup of each main ingredient. It’s the sugars, fats, and air bubbles from churning it that keep ice cream from freezing solid. Hagen Daz means nothing, it’s gibberish. The top three seafood eaten in the U.S. is shrimp, canned tuna, and salmon. I like shrimp and salmon. People over the age of 55 eat the most ice cream. I’m 56 and I seldom eat the stuff. In 1939, a bill was introduced in Maine making it illegal to put tomatoes in clam chowder. The first square bottom paper bag for groceries was introduced in 1877. The first plastic bag for groceries was introduced in 1977. Guess innovation runs slow in the grocery bag arena. Moms already know that shoppers with kids buy 40% more groceries. At one time, lobsters were so plentiful that in Colonial America they were the primary food for the poor. Chef Boyardee was a real person, but he spelled it Boiardi and was an Italian restaurateur before starting the chain bearing his name. Jack in the Box opened the first drive through in 1951. In 1937 the Kraft company invented the first prepackaged meal, their iconic Macaroni and Cheese. I still love the stuff. Only North Americans call it corn. The rest of the world calls it maize. Corn was the term used for generic cereal grains, usually of low quality. The cartoon Popeye complete changed the spinach industry and for decades spinach was the most popular vegetable among kids. When I was kid, Mom would serve it and my brother and I would eat it last so the other food didn’t cover up its strength building power. I was a teenager before I knew what hot spinach tasted like. Spinach, by the way, was the first vegetable to be frozen and sold. Hushpuppies are called that because they were fed to the hunting dogs as treats to keep them quiet. Anyone who watches The Big Bang Theory already knows that Fig Newtons were named for a little town in Massachusetts. 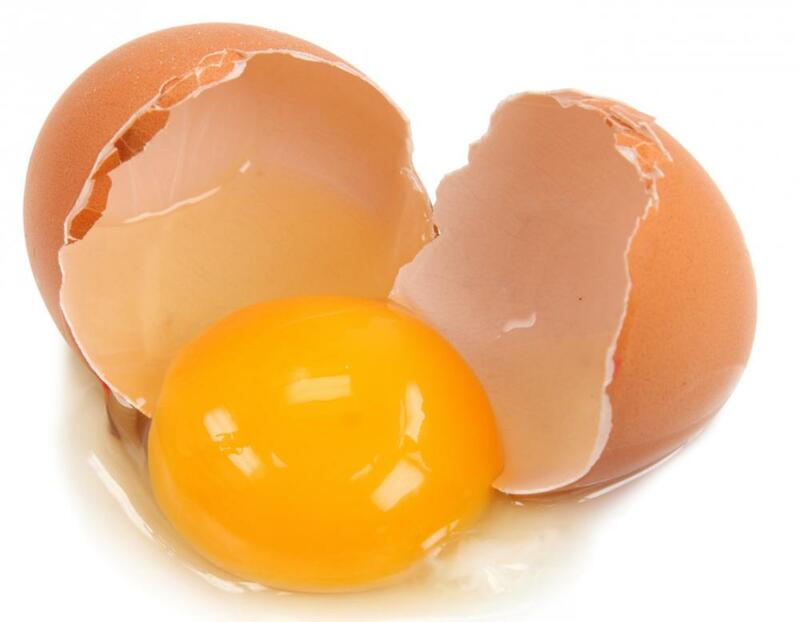 White eggs and brown eggs are identical in every single way except the color of the shell. RC cola was the first soft drink to be sold in a can. The top week for pizza sales is Superbowl week. In D.C., it’s widely known that when something important is going on in the government pizza sales increase dramatically. The average chicken lays about 300 eggs a year. The ancient Incas invented peanut butter. I always thought it was George Washington Carver. Gelatins are made from animal hooves, bones, and hides. Nothing gets wasted, does it? 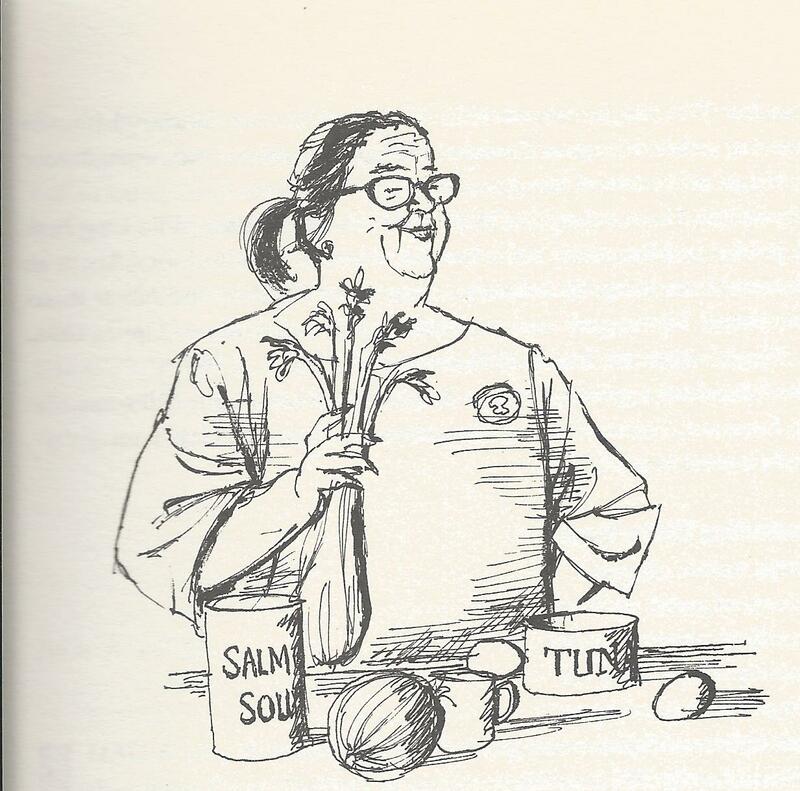 Anyone who’s read this blog for a while knows I like many celebrity chefs, but my favorites are The Two Fat Ladies from Great Britain. Sadly, both Jennifer Paterson and Clarissa Dickson Wright have passed away, Clarissa just this year. But their legacy and popularity lives on after them. I once described Clarissa as “a friend I never met” because she always seemed the one of the pair that was more down to earth. Recently, though, I’ve been reading a lot about Jennifer and, like millions of her fans, I have fallen in love with her all over again. 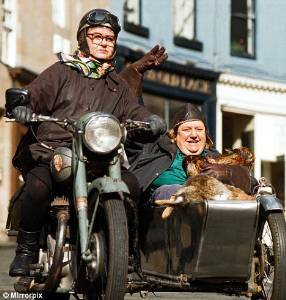 That’s Jennifer driving the motorcycle in the iconic picture of The Two Fat Ladies. She was known all over London and beyond by her helmet and her two-wheeled transportation. At her funeral, her helmet sat in a place of honor, almost revered as a saintly relic. Yet I’ve seen her collect eggs, shellfish, and mushrooms in that helmet, never caring about the dirt or aromas transferred to it and thus to her hair. One of the books I’ve read recently is called Enjoy! 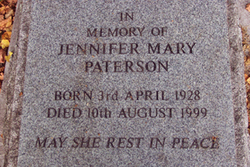 A Celebration of Jennifer Paterson. From her brother describing a party: During the revels there may conceivably have been some sort of encounter with one of the young female dynasts in a less well-lit part of the garden – memory is extremely vague at this distant remove. Anyway, the pirate’s hat (made from a black stocking hat of Jennifer’s) lost, forgotten and never recovered. I do recall, however, with startling clarity, my sister’s displeasure the following morning at the loss. From a young man to whom she was a nanny: She treated everyone exactly the same, be they her perennial entourage of high-ranking officers of the Catholic Church, my school-mates, dinner guests, porters, waiters, girl-friends, the rich and famous, or even our dogs: she had something to say to everyone, and would usually leave us laughing, but often feeling a bit battered by the encounter. 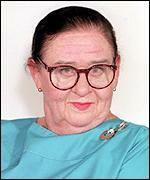 Most evenings she would end up singing . . . .
From a man who had hired her: Actually, I used to sack her quite often. Very rarely to do with anything she had or hadn’t done. Just the amount of drink I’d had, most likely. Be she was solicitous enough never to fail to turn up the following day. From her producer/director: [while in the hospital with her final illness] Jennifer was enormously touched when the Prince of Wales sent her a vat of organic soup and some ice cream from his private kitchens along with a handwritten get-well note. She hugely enjoyed the food but it provided us with a difficult social conundrum. What was the etiquette for dealing with the Tupperware containers it had arrived in? From Clarissa, the other Fat Lady: Programme two, filmed at Westonbirt girls’ school saw the famous 180-degree turn [on the motorcycle]. — On this occasion I wasn’t aware what she was going to do and neither was [the producer/director], who rushed over afterwards to protest that we weren’t insured for stunts; so reassuring. Also from Clarissa: I remember driving through London in some parade in a vintage Bentley with cheering crowds and Jennifer remarking, ‘Now I know how Hitler felt.’ You never knew what she would say next and that, I suppose, was the fun of it all. Another book I’m reading is a collection of columns she wrote for a British magazine called The Oldies. 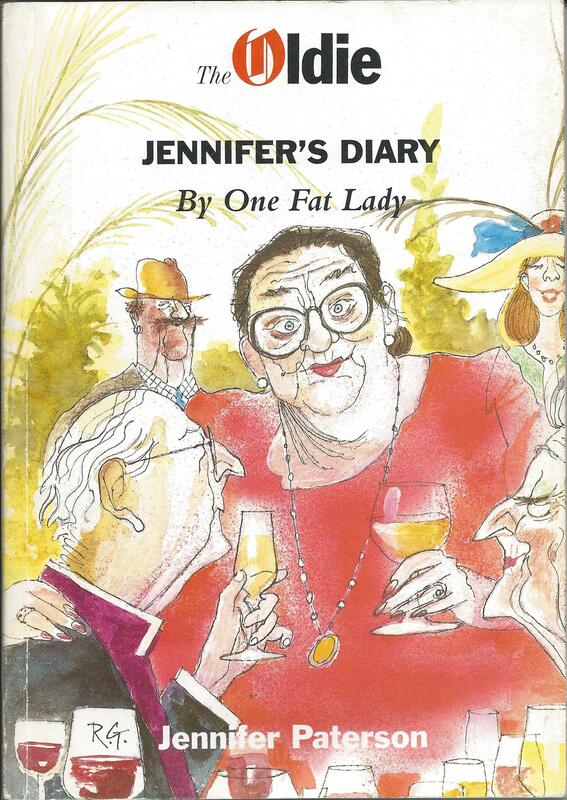 It’s set in diary fashion and is a slice of Jennifer herself. My personal favorite Jennifer quote comes from the second show (mentioned above.) The Two Fat Ladies have provided lunch for some girls at a girls’ school and it’s late in the day, they are relaxing and Jennifer lights up a cigarette. Clarissa says, “You can be expelled for that, you know.” Jennifer lifts her head proudly, blows a huge billow of smoke out of her lungs, and says in a regal tone and perfect British accent, “I don’t care!” Classic Jennifer. Post # 311 It Was a Floury Kind of Day . . . .
November 19, 2014 at 9:46 AM | Posted in Uncategorized | Comments Off on Post # 311 It Was a Floury Kind of Day . . . . Yesterday, I was wearing a dark gray t-shirt that I like cuz it’s nice and thick, and warm, and soft. It’s a nice shirt. When I took it off last night, I noticed that there were streaks of flour still on it that I had not been able to brush off. I laughed a little because it had been a floury sort of day. Once those were done, I had to start setting up for dinner. I was making Pasta with Lemon Sauce (which I’ve blogged about a couple of times here), and grilling a London Broil steak. Searching the pantry, I found half a box of whole wheat spaghetti which would do for the pasta, but I decided to turn my hand to making home made pasta. I’ve done it many times in the past, and thought now would be a good time. 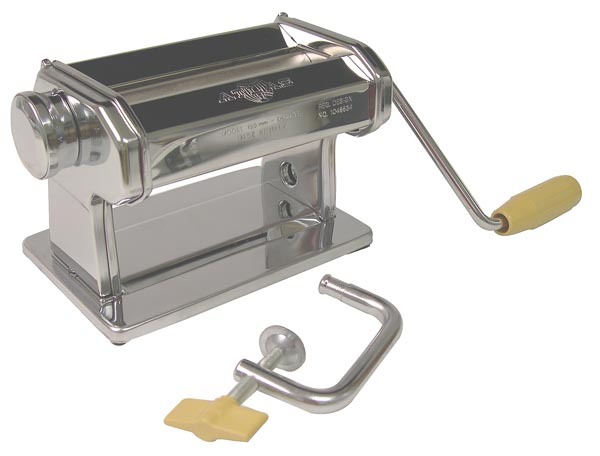 It’s a pasta rolling machine. It makes the task of making home made pasta super easy. I used to have one. I must have gotten it as a gift, because it’s not the sort of thing that I would even know to get for myself. The way it works is you clamp it down to a solid surface then put a small piece of dough into the hopper. There are several settings for width. 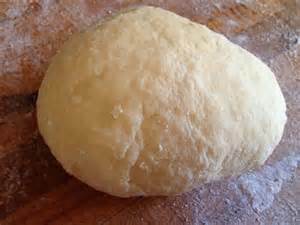 You set the width at the widest setting and crank the dough through. Then you set the width a little smaller and go progressively through until you have the desired width for your pasta. 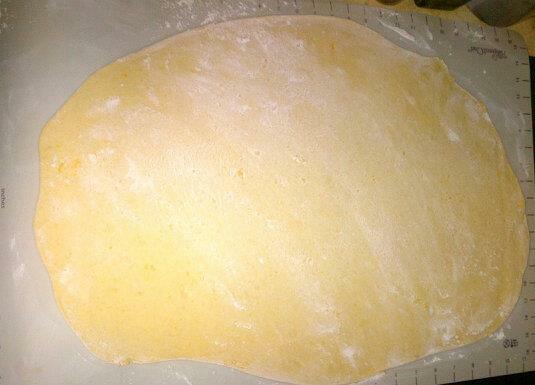 By now, the small piece has stretched and grown into a large sheet of dough. Then, you put the sheet through the cutters and make noodles of a couple different sizes. This is all accomplished in the space of just a few minutes. But I don’t have one of these anymore. I know I’m getting one of these as soon as I can, though. Because I made pasta by hand yesterday. It’s easy enough a process, but it makes your muscles ache! First, you have to make the dough. It starts out easy enough. 1 1/2 to 2 cups of flour, and eggs. 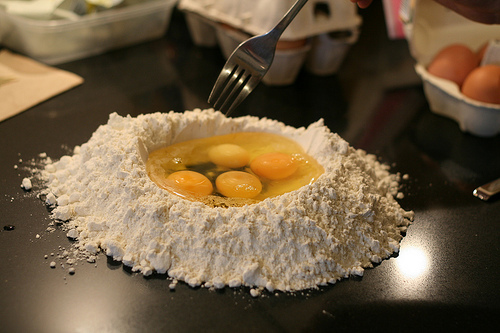 You make a well in flour, pour in the eggs, and using a fork, you mix the two together. Easy, right? Well, not so much. 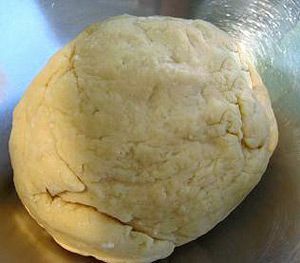 Every bit of flour has to be incorporated and the dough is incredibly stiff. Think old play-dough. By the time you reach the end, this is the only way to do it. Which is fine, because the dough has to be kneaded anyway. I ended up working the dough for about 30 minutes before it was to the right state. Either one of these is correct. The one on top is a trifle drier than the bottom. 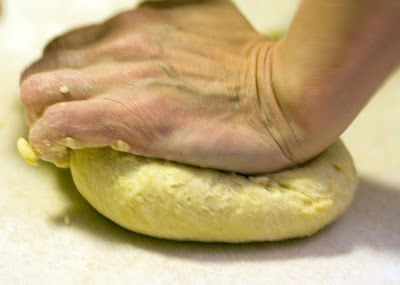 That’s easy to fix with a few drops of water or olive oil and more kneading, but isn’t necessary. If you have the pasta roller machine, this is all corrected during the rolling out process. 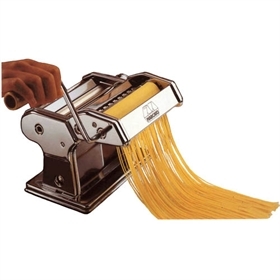 If you don’t have the pasta rolling machine, then this is what you must do. 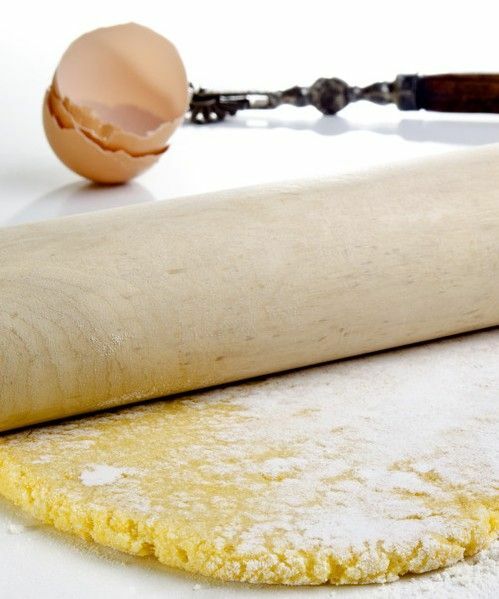 That’s a rolling pin, people. So you roll and roll until the dough is thin enough for the pasta you want. For most noodles, you want it thin enough so you can just see through it. Now, at this stage, you’re going to shape your pasta. If you’re making noodles, as I was, you’re going to fold it or roll it up. Either way, you want to be certain the pasta doesn’t stick to itself when you unroll it, so sprinkle it very lightly with flour and brush it evenly across the surface. 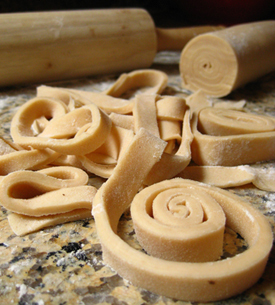 After you’ve rolled/folded it, use a very sharp knife to cut noodles of the desired width. Then unroll them and place them on a lightly floured towel. If you’re making them for another day, you can hang them on a drying rack, but I typically don’t do that. The difference between fresh pasta, and store bought pasta (even those brands that claim to be fresh, not dried, etc.) it like the difference between store bought and fresh bread; the difference between store bought and vine ripened tomatoes (yum! ); the difference between fresh brownies and, well, any brownies are good so never mind. (mmm, brownies! maybe another flour day?) My pasta actually turned out thicker than I wanted, was a lot chewier than I wanted, but what a flavor! Fresh pasta cooks MUCH faster than dried pasta. Make sure the water is boiling fast and is lightly salted. The past will initially sink, then as the water returns to boiling, it will rise. In 2-5 minutes, it will be done. The best way to tell is to try a piece. The pasta will swell a bit and be thicker, but it will be so yummy! I clean as I go, so the kitchen was in a good state. There were no major messes to clean up after dinner. As I said, the only real aftermath, apart from full stomachs, was a streak of flour on my t-shirt that I missed. In The Hobbit, Gollum and Bilbo engage in a riddle contest to determine if the Gollum is going to eat Bilbo or show him the way out of the caves. One of those riddles is, “A box without hinges, key, or lid, Yet golden treasure inside is hid.” The answer to that riddle is the subject of today’s post. I’ve written about eggs before, and undoubtedly will write about them again. Eggs are good, and we’re finding out that they’re good for you. I won’t go into the studies, science, or details, but nutritional experts everywhere are changing their minds about eggs. But that’s not what I’m about today. We’re going to talk about having eggs for dinner. We do this a lot in our household. About half the time, it’s good ole bacon and eggs with whatever else we feel like. But the other half of the time, it gets a lot more complex, but still as tasty and simple as bacon and eggs. Eggs are inexpensive and can go a long way. 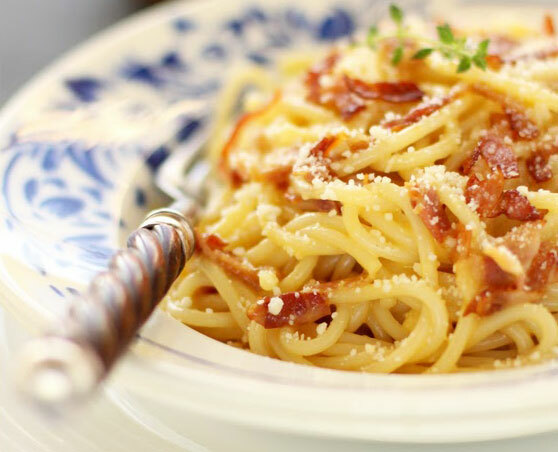 Ever had Pasta Carbonara? It’s a pasta and egg dish where the egg is cooked by the hot pasta and creates an unctuous sauce. It’s totally simple. Start water boiling for whatever pasta you’re going to use. Traditionally, a long thin pasta is used like spaghetti or fettuccini, but whatever you have on hand is going to be okay. Cook your pasta according to the directions. While it’s cooking beat one egg per two servings of pasta. Into the egg, add a pinch of salt and pepper, and about a quarter cup of parmesan cheese. Fresh grated is best, but the powdered stuff in the jar works just as well. Beat it all together well. When the pasta is done, drain it and put it immediately in a large bowl. Pour the egg mixture over the pasta and toss with wooden forks until all the pasta is completely coated and the egg has turned into a sauce. Serve immediately. Most of the time, I sprinkle it with extra cheese, and I toss fresh bacon crumbles into it while tossing the egg. I’ve also seen some recipes that call for fresh steamed peas, or other vegetables. 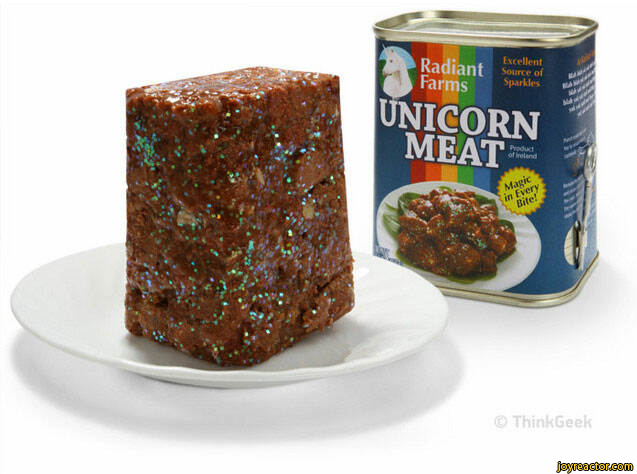 I’m thinking sautéed mushrooms would be good, too. However, eggs on top of pasta works for a ton of different dishes. I’ve seen a poached egg put on top of plate of pasta. When the diner breaks the egg, the yolk runs into the pasta and whatever is dressing the pasta to create a rich sauce. The judges on Chopped seem to love this technique. The Brits have a wonderful dish called Toad in the Hole. It can be made many ways with sausages, meats, or eggs. I’ve talked about it before on the blog, but it bears repeating. Take a slice of good bread. Cut a hole or a shape in the middle but save the piece you cut out. Butter both sides of the bread. Heat a non-stick skillet. 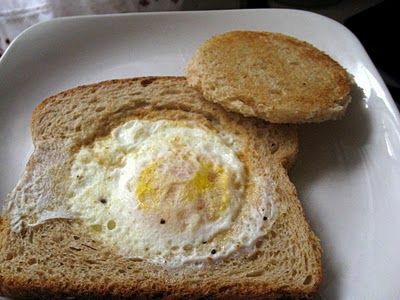 If you want sunny side up eggs, toast one side of the bread in the skillet, then turn it over. Pour the eggs carefully into the cutout so they are directly on the skillet. Cook carefully until the eggs are set. Eat hot. If you like your eggs fried solid, put the bread in the hot skillet and put the egg in immediately. Flip the bread carefully with the egg in it. Cook until done to taste. You can also toast the cutout at the same time and serve it as an extra piece of toast to sop up the yolk. However, you take this up a few levels by making a crostini, or toasted cheese sandwich, or a mock cheese soufflé on toast and putting a poached or sunny side up egg on top of it. Shirred Eggs is just a fancy way to say baked eggs. They’re actually really good, and really easy. I posted once about shirred eggs in a ramekin “nest” made from cooked spinach and cheese. But then I found another recipe that sounds just as good and only requires two ingredients. This recipe makes one so adjust as needed. Heat your oven to 350. Take one medium ramekin and spritz a little cooking spray or olive oil in it. You only need a little. Place the ramekin on a baking sheet. Then take two pieces of prosciutto and line the ramekin folding in as necessary. The prosciutto should not go over the top of the ramekin or it will burn. If you do have burnt prosciutto, just use a sharp knife or a pair of scissors to trim off the burn. Cook the prosciutto in the ramekin by itself until it’s crispy, about five minutes or so. 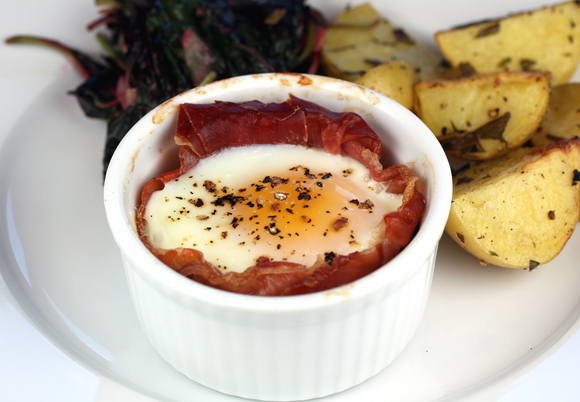 Remove the ramekin from the oven and carefully place an egg into the ramekin with the prosciutto in it. Cook in the oven until done to desired state. Sprinkle with salt and pepper and serve. Be careful as the ramekin will be hot. If you’re very adept and careful, you can remove the prosciutto “cup” and serve it that way. The list goes on and on, but I’m going to leave you with a couple of vegetable dishes. It’s easy to cook your favorite veggie and put a cooked egg on top just before serving. I like to steam asparagus, squeeze some lemon over it, and add a lightly fried egg. The picture shows it with a piece of prosciutto underneath which I’ve never tried, but I can’t imagine it being anything but good. Finally, I’m going to tell you about one of my favorite ways to dress up Brussels Sprouts. Lots of people don’t like them, but I’ve liked the “little baby cabbages” since I was five. My favorite way to eat them is to steam them up with some salt, put them in the fridge to chill, and eat them icy cold with that touch of salt and juiciness from the steam. 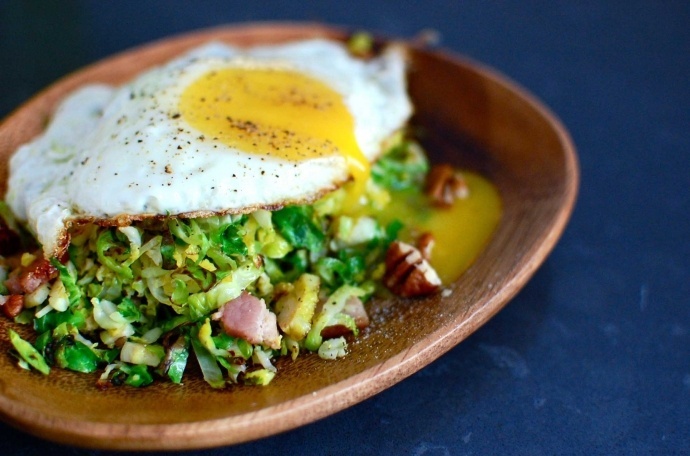 Partner/Spouse introduced me to Brussels Sprouts Hash. You take as many Brussels Sprouts as you want and cut them into shreds. Then add chopped green onion, chopped regular onion or chopped leeks. Fry some bacon in a large skillet and break into pieces. Drain all the grease except 1-2 tablespoons, depending on how many vegetables you have. Heat the grease and put all the chopped veggies in and stir fry until crisp tender. 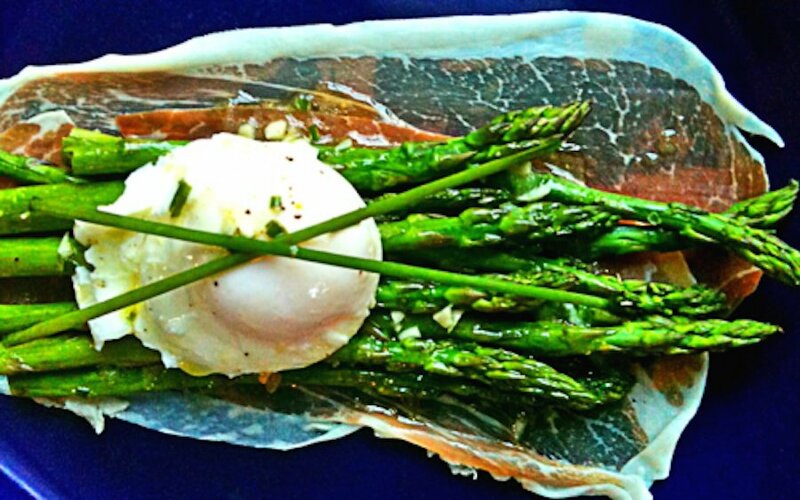 Serve hot, BUT if you have a mind to, lightly fry or poach an egg. Leave the yolk runny. Gently place the egg on top of each serving. As the yolk breaks and runs into the hot veggies, it creates a good sauce, similar to Carbonara. Good stuff.